Poor battery life on the Flame device? The new Firefox OS reference phone is called the Flame. I have one that I’m using as my day-to-day phone, and as soon as I got it I found that the battery life was terrible — I use my phone very lightly, but the battery was draining in only 24 hours or so. It turns out this was because a kernel daemon called ksmd (kernel samepage merging daemon) was constantly running and using about 3–7% of CPU. I detected this by running the following command which prints CPU usage stats for all running processes every five seconds. ksmd doesn’t seem very useful for a device such as the Flame, and Alexandre Lissy kindly built me a new kernel with it disabled, which improved my battery life by at least 3x. Details are in the relevant bug. It seems that plenty of other Flame users are not having problems with ksmd, but if your Flame’s battery life is poor it would be worth checking if this is the cause. There’s been a lot of focus on B2G memory consumption in the past four weeks. Indeed, of the 38 MemShrink bugs fixed in that time, a clear majority of them relate in some way to B2G. In particular, Justin Lebar, Kyle Huey and Andrew McCreight have done a ton of important work tracking down leaks in both Gecko and Gaia. Many of these have been reported by B2G partner companies doing stress testing such as opening and closing apps 100s or 1000s of times over long period. Some examples (including three MemShrink P1s) are here, here, here, here, here, here, here and here. There are still some P1s remaining (e.g. here, here, here). This work is painstaking and requires lots of futzing around with low-level tools such as the GC/CC logs, unfortunately. Relatedly, Justin modified the JS memory reporter to report “notable” strings, which includes smallish strings that are duplicated many times, a case that has occurred on B2G a couple of times. Justin also moved some of the “heap-*” reports that previously lived in about:memory’s “Other measurements” section into the “explicit” tree. This makes “explicit” closer to “resident” a lot of the time, which is a useful property. Finally, Luke Wagner greatly reduced the peak memory usage seen during parsing large asm.js examples. For the Unreal demo, this reduced the peak from 881MB to 6MB, and reduced start-up time by 1.5 seconds! Luke also slightly reduced the size of JSScript, which is one of the very common structures on the JS GC heap, thus reducing pressure on the GC heap, which is always a good thing. June 14, 2013 is the second anniversary of the first MemShrink meeting. This time last year I took the opportunity to write about the major achievements from MemShrink’s first year. Unsurprisingly, since then we’ve been picking fruit from higher in the tree, so the advances have been less dramatic. But it’s been 11 months since I last update the “big ticket items” list, so I will take this opportunity to do so, providing a partial summary of the past year at the same time. This had two parts. The first part was the sharing of immutable parts of scripts, which Till Schneidereit implemented. It can save multiple MiBs of memory, particular if you have numerous tabs open from the same website. The second part is lazy bytecode generation, which Brian Hackett has implemented and landed, though it hasn’t yet enabled. Brian is working out the remaining kinks and hopes to land by the end of the current (v24) cycle. Hopefully he will, because measurements have shown that it can reduce Firefox’s memory consumption by 5% or more on common workloads! That’s a huge, general improvement. Furthermore, it significantly reduces the number of things that are allocated on the GC heap (i.e. scripts, strings, objects and shapes that are created when bytecode for a function is generated). This reduces pressure on the GC which makes it less likely we’ll have bad GC behaviour (e.g. pauses, or too much memory consumption) in cases where the GC heuristics aren’t optimal. Bill McCloskey implemented zones, which restructured the heap to allow a certain amount of sharing between zones. This greatly reduced wasted space and reduced memory consumption in common cases by ~5%. Some more could still be done for this issue. In particular, it’s not clear if things have improved enough that many small JSMs can be used without wasting memory. Nonetheless, things have improved enough that I’m happy to take this item off the list. This item was about getting about:memory (or something similar) working on B2G, and using it to optimize memory. This was done some time ago and the memory reporters (plus DMD) were enormously helpful in improving memory consumption. Many of the fixes fell under the umbrella of Operation Slim Fast. So I will remove this particular item from the list, but memory optimizations for B2G are far from over, as we’ll see below. pdf.js was recently made the default way of opening PDFs in Firefox, replacing plug-ins such as Adobe Reader. While this is great in a number of respects, such as security, it’s not as good for memory consumption, because pdf.js can use a lot of memory in at least some cases. We need to investigate the known cases and improve things. While we’ve made great progress with memory profiling tools that help Firefox developers, the situation is not nearly as good for web developers. Google Chrome has heap profiling tools for web developers, and Firefox should too. (The design space for heap profilers is quite large and so Firefox shouldn’t just copy Chrome’s tools.) Alexandre Poirot has started work on a promising prototype, though there is a lot of work remaining before any such prototype can make it into a release. Cervantes Yu and Thinker Li have been working on Nuwa, which aims to give B2G a pre-initialized template process from which every subsequent process will be forked. This might sound esoteric, but the important part is that it greatly increases the ability for B2G processes to share unchanging data. In one test run, this increased the number of apps that could be run simultaneously from five to nine, which is obviously a big deal. The downside is that getting it to work requires some extremely hairy fiddling with low-level code. Fingers crossed it can be made to work reliably! Generational GC will reduce fragmentation, reduce the working set size, and speed up collections. Great progress has been made here — the enormous task of exactly rooting the JS engine and the browser is basically finished, helped along greatly by a static analysis implemented by Brian Hackett. And Terrence Cole and others are well into converting the collector to be generational. So we’re a lot closer than we were, but there is still some way to go. So this item is steady at #2. Firefox still uses much more memory than other browsers on image-heavy pages. Fortunately, a great deal of progress has been made here. Timothy Nikkel fixed things so that memory usage when scrolling through image-heavy pages is greatly reduced. However, this change caused some jank on pages with lots of small images, so it’s currently disabled on the non-trunk branches. Also, there is still a memory spike when memory-heavy pages are first loaded, which needs to be fixed before this item can be considered done. So this item remains at #1. Three items from the old list (#3, #4, #5) have been ticked off. Two items remain (#1, #2) — albeit with good progress having been made — and keep their positions on the list. Three items have been added to the new list (#3, #4, #5). Kyle Huey made image.src='' discard the image immediately even if the image is not in the document. This provides a way for image memory to be discarded immediately, which is important for some B2G apps such as the Gallery app. This was a MemShrink:P1 bug. Justin Lebar fixed a bad leak in AudioChannelAgent. Mike Habicher fixed an image-related leak that was manifesting on B2G. I exposed the existing JSON memory report dumping functionality in about:memory. 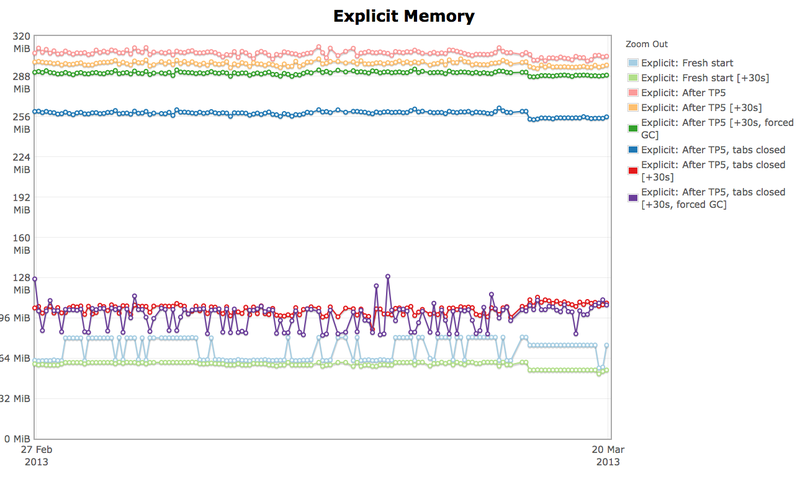 As a result, gzipped JSON is now the preferred format for attaching memory report data to bugs. This was a MemShrink:P1 bug. Honza Bambas overhauled the DOM storage code. Apparently this might reduce memory consumption, but I fully admit to not knowing the details. Nicolas Silva fixed a leak in layers code relating to OMTC. I removed the MEMORY_EXPLICIT telemetry measurement. I didn’t want to do this, but it’s been causing hangs for some users, and those hangs are hard to avoid due to the complexity of reporting memory consumption from web workers. Furthermore, in practice the measurement was sufficiently noisy that we’ve never gotten anything useful from it. Mozilla code uses a mixture of fallible and infallible allocations. In theory, any allocation that could allocate a large amount of memory (e.g. a few hundred KiB or more) should use a fallible allocator. We’ve seen recently some cases where large allocations were being made infallibly, which led to OOM crashes. Bug 862592 proposes adding an assertion to the infallible allocators that the request size isn’t too large. This is an easy bug to get started with, if anyone is interested. Details are in the bug. I will be on vacation during May. As a result, there will be no MemShrink reports for the next three fortnights. (Although I’ll be away for just over four weeks, that period covers three MemShrink meetings.) I’ll be back with the next report on June 11. See you then! Bill McCloskey landed zones, a.k.a. compartment groups. This mitigates the overhead of each compartment by allowing all compartments within a zone to share arenas and strings. Roughly speaking, each tab gets its own zone, and there’s a system zone for Firefox’s internal use. This was a MemShrink:P1 bug. The following graph from areweslimyet.com shows the impact of zones — about 5/6 of the way along the graph there’s a distinct drop, most noticeable in the dark blue line. The light green line (settled start-up) showed a ~6 MiB drop, which is ~10%. Note that the fraction of JS memory in areweslimyet.com is less than that in typical sites, so the drop in the higher lines is smaller than the improvements normal users should see. Avi Halachmi fixed a problem where badly managed gradients could cause spikes of 10s of MiBs when tab animations occurred. This was a MemShrink:P1 bug. The fix has been backported to Aurora. Jed Parsons fixed excessive memory consumption by Persona after visiting the B2G marketplace. At least, I think that’s what happened; I won’t pretend to genuinely understand what went on in that bug. This was a MemShrink:P1 bug. Fabrice Desré fixed a bad B2G leak relating to error messages. This bug was fixed before it was triaged in a MemShrink meeting, but it probably would have been a MemShrink:P1 because it could cause the phone to OOM after a few hours. I removed all uses of nsFixedSizeAllocator. This was only a small memory consumption win (a few 10s of KiBs) but it cut several hundred lines of code, and removed another low-quality custom allocator (and attractive nuisance) from the codebase. I added a “js-main-runtime-temporary-peak” memory reporter, which measures the peak size of the main JSRuntime’s “temporary” pool, which mostly holds parse nodes. These are short-lived but they can be quite large — 10s of MiBs in normal browsing, and we’ve seen it exceed 1.5 GiB on large asm.js examples. Relatedly, I reduced the size of parse nodes by 12.5% on 64-bit platforms, and 16.7% on 32-bit platforms. Sometimes, especially on B2G, we have excessive memory consumption due to JS strings. It would be useful to be able to dump the contents of all the strings in memory, to look for ones that shouldn’t be there. Bug 852010 has been filed for this. It shouldn’t be too hard, as it would fit in with the existing JSON memory report dumping infrastructure. This is currently blocking bug 850893, a B2G MemShrink:P1 bug. Please comment in the bug or contact me if you want to get involved. Bug 846616 and bug 850545 both are about high “heap-unclassified” values. Reducing “heap-unclassified” is getting very difficult, because the memory is often allocated in ways we can’t measure by third-party code such as Cairo and graphics drivers. I suppose in the Cairo case we could put effort into adding some memory profiling infrastructure and try to get it upstreamed, but the driver situation seems pretty hopeless. Till Schneidereit implemented sharing of bytecode and related script data. This can result in significant savings, especially if you have multiple tabs open from the same site. For example, with 10 articles open from theage.com.au I saw an 11.6 MiB saving. This was a MemShrink:P1, and its fix completes half of the “Better Script Handling” item from the MemShrink big ticket items list. Terrence Cole fixed a bad regression that was causing multi-GiB memory spikes when using certain regular expressions. He landed this fix on the Nightly, Aurora and Beta channels. I reduced the overhead of small compartments a little. This reduced the size of an unloaded tab from 222 KiB to 192 KiB on 64-bit platforms. Jason Orendorff removed some source notes that are no longer required now that SpiderMonkey’s decompiler has been removed. This slightly reduces the size of the “script-data” entries in about:memory. I modified js::Vector so that it doesn’t waste space when its elements have a size that is not a power of two. Chris Jones fixed a bad leak in the IPC code. This is a big deal because B2G testing has found several cases of steadily growing memory consumption that lead to the devices becoming unusable, and there’s a good chance that this leak was responsible for some of them. More testing is needed to determine exactly how many problems this has fixed. It’s not surprising that IPC code is causing B2G problems, because that is code that desktop Firefox uses only lightly (for out-of-process plug-ins), whereas B2G uses it very heavily. There’s a bug open for detecting such leaks that should be fairly easy to implement, and potentially could lead to big fixes, which is currently looking for an owner. Matthew Gregan fixed a bug, present only in Firefox 17 ESR, that was causing HTML5 videos to consume multiple GiBs of memory. Alexandre Poirot fixed another leak in the Add-on SDK. Jonathan Kew reduced the amount of memory consumed by textruns when Facebook Messenger is enabled. David Keeler fixed a leak relating to IndexedDatabaseManager.